Everyone has a different way to relax after a hard day of work, and for Pat Sansone and John Stirratt, the best way to clear their heads after playing to thousands of people for weeks on end was to find time to craft Fifth, the latest immaculately rendered pop opus from their long-running duo The Autumn Defense. 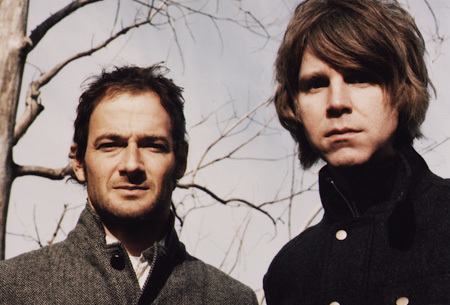 Recorded on the fly between Wilco tours, multi-instrumentalists and producers Sansone and Stirratt recruited members of their touring band for the first time in the making of an Autumn Defense record. Confident grooves underly the duo’s masses of harmonies and carefully layered guitar chimes for what the pair consider one of their most varied efforts to date. From their native Chicago, the pair talked about finding time to make the album, balancing production and songwriting, and working with their live band in the studio. So where did the name Fifth come from? Were you stuck for a name and went “ah it’s the fifth one” or is there a symbolism there? Pat Sansone: We searched through the song titles and the lyrics to try to find something that sums up the entire record for us, but nothing really felt like it was a fully encapsulating umbrella or blanket statement for the record. We felt like every song had its own identity, its own place. There wasn’t an overarching theme that we were aware of. There might be one from the outside. So every song is doing its own thing? PS: Yeah, that’s the way we see it from the inside. But a listener from the outside is going to make their own connections between the songs. It will be interesting to see what that thread is to other people. What do you think you guys touched upon thematically with this record? John Stirratt: Personally, a few of my songs touch on difficulties of living in big, cold cities and the challenges related to that. The song “What’s It Take,” the final song, is related to the challenges of urban life and seasonal depression. PS: And that is contrasted with something like “August Song” which has more of an optimistic tone. “What’s It Take” is more of the winter song and “August Song” is more of the summer song. There are songs like “I Want You Back” that have a melancholy, longing quality. It’s about the ending of a relationship while “This Thing That I’ve Found” is about the very beginnings of a relationship, finding a love and being a little bit nervous about it. There are several songs about remembrance and nostalgia and reflection, but at different points in the cycle of a relationship. I guess they’re really all relationship songs. Different examinations of a relationship. Obviously you guys are very busy with lots of different projects, including Wilco. When did you find time to work on this? PS: Well, whenever we could. It was a very busy year, last year. Wilco spent more time on the road in 2012 than in any other year of its existence. We ended up filling whatever empty holes there were in the calendar with working on this record. Whatever time there was, we made use of. Is it stressful to balance two long-running projects, or do you view this as a way to relax after a long Wilco tour? PS: It’s both. I wouldn’t necessarily call it winding down. It’s good for the musical mind to have some variation in the things that you do. It definitely can be stressful when you’re trying to juggle multiple projects in a limited time frame and you’re trying to do something that you care about. We tend to be, I wouldn’t say perfectionists, but we really care about the way these Autumn Defense records sound and the way they are arranged. It’s very consuming. You’re both multi-instrumentalists and you both have production experience, so you can make these orchestral albums that sound very full. Between the two of you, is it tough to get everything right? PS: For me that’s part of the fun of the record making. I love arranging and producing, and I love records that have complex or heavily considered arrangements. The trick is when you’re doing that, to not let the arrangements completely overshadow the essence of the song. That’s the tight wire act that you’re doing, to make the arrangements and production interesting but hopefully still connected to the songs themselves. You have to make sure they grow out organically from the song and aren’t the point of the song. And how can you tell when you’re on the right side of the line? PS: I think you just have to trust your instincts, because there’s certainly no rule book, but there are great examples to follow. We want to make records that sound like the records that we like to listen to. It’s a matter of trusting your instincts and trusting your taste. What were some of the records you were using as examples? PS: Well, John and I have a shared love for certain records. Early on in our friendship and in the creation of the band, we were heavily into records like Odessey and Oracle by The Zombies. Love’s Forever Changes was a big one for us. The Kinks’ Village Green Preservation Society and certainly The Beatles catalog and the later period Beach Boys records. Those are all albums that have a combination of amazing, soulful songwriting and very creative and interesting studio production and arrangements. So this is the fifth album. Do you view this as a summary of what the Autumn Defense is capable of, or is this your attempt to move into a different direction? PS: I wouldn’t say we’re necessarily trying to break down any walls. I think it sounds a lot like us. JS: I think whenever we set out to do a record, we know what we can do well, and it’s a question of trying to make the songs as good as they can be and make the record sound as good as it can be. I don’t think there are any grand plans beyond that. PS: I feel the same. I think it’s more likely that listeners from the outside are going to be able to tell what’s different, more so than we are, because we’re so far inside it. We approach every album with the same mission as the previous, which, like John says, is to come to the record with material that we feel strongly about. Did you have any guests on the record? PS: This is the first album that we’ve utilized our core live band that we’ve had for the last seven or eight years. In the past we’ve made our records in various studios, John and I being the core members. Our drummer Greg Wieczorek has been with us since the very early days of the band. In the past we put the recording sessions together using various musicians here and there — guests and old friends — but this is the first time where we brought our live band with us into the studio and tracked the basic tracks with the live band. So this was the foundation that set the tone of the tracks. Do you think that affected the finished product? PS: I think so. I think it’s a little more grounded in its sound. I think each track, even though there are variations in the style and the arrangements, I think there is a core sound that connects all the tracks. Maybe I just say that because I was there and I know how it was made, but my instinct is that it sounds like a particular group of people playing together. JS: Yeah, there is a little more of a thread. Even when we did build tracks on previous records, we’re very conscious about it sounding like a performance, and when the track is done, there is a basic performance there. But on these performances there is more interplay between players, a little bit more kinetic energy. It’s more obviously a live ensemble playing. Did it take some time to open up and let the live band into the studio? Because for a while you did everything almost exclusively yourself. Did it take a while to make space for them in the creative process? PS: Yeah, maybe so. It was a conscious decision. We wanted to have that experience. We love working with our band and they are amazing musicians, and we just knew it was time to have them onboard, just for the enjoyment level. JS: And everyone was available. They’re all working musicians themselves. Our drummer has been playing with Norah Jones for the last couple years, our bass player is a studio musician in Nashville, our guitar player plays with people around Chicago. Everyone is busy, but we got lucky this time in that everyone had the time. We scheduled our sessions so we could all get together for a week here or a week there.